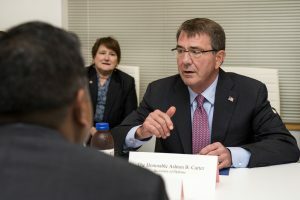 It’s been one year since Secretary of Defense Ash Carter announced the formation of the Defense Innovation Unit-Experimental (DIUx), the centerpiece of the Pentagon’s new Silicon Valley outreach effort designed to bring private sector technology innovations into the military at a faster pace and at lower cost than the big iron projects of the past. Since the initial formation of DIUx, Carter has expanded the unit’s presence to the East Coast, announced structural changes to the organization, and issued the first actual contract in only 31 days. According to Carter, the foundation has been laid for a more nimble acquisition system. Carter detailed some of those new acquisition practices in July, when he officially opened the Boston DIUx office. Among those practices is a new private sector engagement mechanism called a Commercial Solutions Opening to take advantage of new authorities granted by Congress for engaging in prototyping. The CSO significantly reduces paperwork requirements for small startups that bring new innovations to the DOD, and allows the department to provide funding in less than 60 days after first contact with a firm and within 30 days after receiving a formal proposal. Speed is critical to the Defense Department’s new acquisition model, Carter said, speaking at the opening ceremony of the Boston office. “If it takes you 15 years to do something, 15 years to complete a program, by definition, that program’s going to be 15 years old in technology terms by the time you complete it. So if you can shorten that and make our programs of record shorter…generally, that saves money, but it also means newer equipment,” he said. Much of the department’s new acquisition mechanisms stem from lessons learned during the course of the wars in Iraq and Afghanistan. During those conflicts frontline military units still struggled with an acquisition system that was used to buying things on a Cold War timetable of years. “We needed to buy things on a time scale of months in order to save lives and win wars,” Carter said. To enhance those speed and agility requirements, Carter reorganized DIUx this summer into three teams: a Venture Team, which will identify emerging commercial technologies and explore their potential impact on the battlefield; a Foundry Team, which will identify technologies that aren’t yet fully developed or require significant adaptation for military applications; and an Engagement Team, which will introduce innovators to military problems and the military to entrepreneurs who can help find solutions. That reorganization memorandum, issued in July, also directed the undersecretary of Defense for Acquisition, Technology, and Logistics to assign qualified contracts and agreements personnel to DIUx and to “use all available authorities and resources to support DIUx’s mission of agile and nontraditional acquisition.” In addition, the directive co-locates, on a rotating basis, one contracting officer at DIUx. At the same time he unveiled the Boston branch of DIUx, Carter also announced nine additional members of the Defense Innovation Advisory Board, which he established in March to help keep the Department of Defense on the cutting edge of innovation. The new additions include Amazon CEO and Chairman Jeff Bezos, Code for America Founder Jennifer Pahlka, and astrophysicist and author Neil deGrasse Tyson. The mission of the board is to find ways to strengthen the Pentagon’s ties to the innovation economy, particularly in the high-tech sector. The board is tasked to provide Carter with initial recommendations by October.